How to select and buy Right Portable Air-Conditioner for your house ? Air conditioner is the most important and useful home appliance in every household. Besides keeping the room temperature low, it also keeps your body and mind cool and fresh in the hot summers. There are three types of air conditioning systems available in the market- window ac, split ac and portable ac. Portable AC is an easy, energy efficient and simple alternative to conventional window air conditioning systems or split units. They are very compact portable cooling system which quickly cools and dehumidifies the room and also provide you the flexibility to move them anywhere from one room to another room in the house. They have wheels and built-in handles and are usually 2.5 feet to 3 feet height. They do not require permanent wall installation but they require a window or a sliding door to vent out the exhaust system. They are suitable to cool the specific areas and are mainly used in small bedrooms in apartments, offices, garages and server rooms where the room temperature is hot because of lack of proper ventilation or poor air circulation and the possibility of getting window ac installed is very nil. Most portable ac models have features like auto timer, self evaporative systems, multiple operating modes, remote control, dehumidifier mode, varible fan speeds, specialized air filters systems, auto start function, to name a few. They provide the best cooling solutions in case of small and rented houses. Most of the people think that portable ac's do not require installation and can be placed anywhere. But like all air-conditioners, lloyd portable ac also need a vent to throw the heat outside. They have a hose pipe to throw the heat outside the house. More the length of hose pipe, more energy is wasted to drive the air through the hose. BTUs rating (British Thermal Rating) : The cooling capacity of an ac i.e, the amount of heat an air-conditioner can remove from the room in an hour is defined by BTU rating. It depends on the size of the room. Bigger sized rooms will require high BTU rating air conditioner to cool it. Be careful while choosing the correct BTU rating for your ac as higher BTU rating ac in a small room will lead to quick cooling and thus it will not be able to dehumidify the air properly. Also, consider the placement of room. Shaded areas will require 10-15% less BTU rating ac's and direct sunlight exposed rooms will require 10% more BTU rating ac and kitchen will need higher BTU ac because of the extra heat dissipated while cooking. Water Removal system : Most of the models have full self-evaporating system wheras few have partial evaporating system. In full evaporative systems, the water does not get collected and AC exhausts all the condensated water through hose. They have a pump where the water is collected in the drain bucket and then pumped out through a hose. For partial evaporative systems units, there is no hose pipe and collected water is manually drained out after evry 3-4 hours depending on tank size and humidity in air. 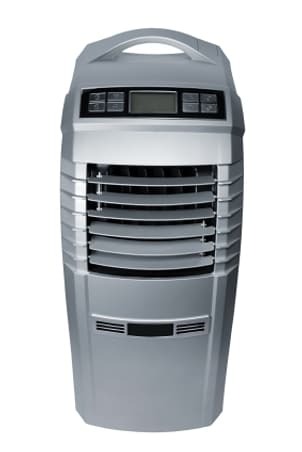 Types of Portable Air conditioner : There are two types of portable ac's – Single Hose Portable ACs and Dual Hose Portable ACs. Single hose portable ac extracts the air from the space, cools it and throws most of the air inside the room and also blowing some hot air outside through the same hose pipe. Double hose Portable ACs take the air from outside through one hose, cools it and ventilates the exhaust hot air through another hose. Dual hose acs consume more energy than single hose portable acs but they give better cooling effect. Special Feature : Certain portable air-conditioners also act as dehumidifiers which not only cools the room but also extract extra moisture from the air. Select the air conditioner with remote control to adjust the room temperatture and air flow across the room. EER rating (Energy Efficiency Ratio) : Portable Acs should consume less power to save your electricity bills. They should have high EER. Higher the EER, more efficient is the Portable AC. Portable AC having EER of 10 is very good rating. Portable ACs are easily to install, do not need any special wiring for installation and can be moved easily from one room to another. Though they require a hose to vent the heat outside the room, the venting process is not very cumbersome and can be vented through a window, sliding door or a wall. They are very cost-effective and energy efficient as compared to other air conditioning systems like window ac's or split units. They are better than air coolers because they have dehumidifiers and air purifiers and do not affect the health of asthma patients. They can be best suited in case you are staying in a small or rented apartment and there is absolutely no hassle of installing AC and spoiling the wall. Portable make noise as they have internal motorized fans as well as motorized compressor systems that cool and circulate the air. Hence it is preferable to purchase the portable ac with special features like sleep mode, programmable timer and multiple speeds. Though the portable ac installation seems to be very simple, but it needs to be placed close to window or door where the exhaust hose is connected. Portable AC's require regular yearly maintenance cleaning air filters and getting it serviced before you start using in summers and also you should make sure that it is properly installed and there is no air leakage to achieve 100% power efficiency and cooling. They are also used in commercial spaces where air conditioner installation is not feasible.